The Real Reason for Canadian Anti-Spam Legislation (CASL)? Here are the opening words from the bill: "An Act to promote the efficiency and adaptability of the Canadian economy by regulating certain activities that discourage reliance on electronic means of carrying out commercial activities...". Wait a tick, I thought this legislation was for the modern world, to bring Canada in line with other countries? Why exactly would we want to "discourage reliance on electronic means of carrying out commercial activities"? Now I work in technology as a self employed web developer with over 15 years in the IT industry. However, I am not one of those tech geeks that think technology is the solution to every problem. In fact, I have often criticized the Alberta Government (and more specifically AHS), for thinking they can solve issues with healthcare and education by throwing technology at it. I frequently see businesses wasting money on overpriced hardware, software, and web solutions when they need to be investing in their core business and people instead. Forget about spam for a second, just where exactly does the Canadian Government get the authority to start regulating by what "means" businesses conduct business? The real reason? I spent some sleepless nights pondering how my business was going to pivot in order to be in compliance with this law. As I was brainstorming new marketing ideas I had an obvious thought, what were the "old means" by which businesses conducted business? Well, the telephone is not practical so it will have to be by snail mail... OH, and there it is! 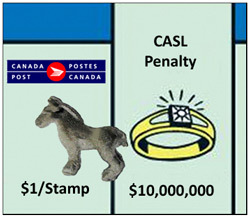 The logical conclusion of this whole CASL phenomenon might just be to resurrect a big, archaic, overpriced, mail monopoly, and crown corporation called Canada Post. Ding Ding Ding! But wait, this new legislation that will "cut down on spam" will apply to all the catalogs, credit card offers, and flyers that Canada Post sticks in my mailbox right? Of course not! We're trying to "discourage reliance" on environmentally friendly forms of communication like electronic messages, and go back to a paper based society where the government gets a cut of the action. Yeah, until the luddites at Government of Canada can figure out a way to tax the internet, e-mail, and other electronic forms of communication, I suspect we will see more regulations that coincidentally benefit Canada Post and other crown corporations. "Under our Government Canada Post revenue mysteriously went up in 2014 and on"
"Canada Post was able to hire more employees as a result of this new mysterious revenue." "Even more Jobs!" Hey, a big horrific bureaucracy regulating businesses trying to use "electronic means" is going to mean more jobs in the CRTC, lawyers hired to fight accusations, and consultants as well as web developers to help businesses comply. Increased revenue from fines - Let's hope they go after the worst violators in Canada and abroad like they promise. Read my first article on How anti-spam legislation is crushing small innovative businesses.